If you're suffering from postmenopausal osteoporosis, consuming a cup of yogurt each day can make a big difference, and we'll tell you why. Continue reading to find out all about the benefits of yogurt in postmenopausal osteoporosis in addition to the best types for those battling the disease. As women age, their bones become weaker, and osteoporosis can develop. Osteoporosis is a degenerative bone disease during which bones become brittle and weak, making them more likely to break. Women can prevent this disease by taking appropriate measures throughout their reproductive lives, which includes the adequate intake of calcium and vitamin D.
Not only is the consumption of calcium essential for strong bones, but when you do not consume enough of the mineral, your body starts to steal it from your bones, which causes them to be malleable and more fragile. However, consuming calcium rich foods is only half the battle. You also have to make sure you're get enough nutrients to aid its proper absorption. Accordingly, along with calcium, you also need vitamin D. This nutrient helps you absorb calcium by directing it from your digestive tract to your organs. 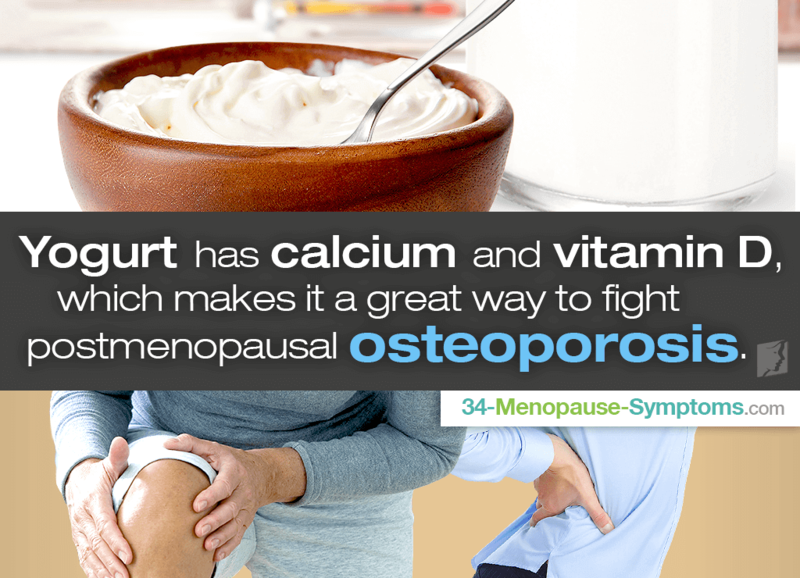 Yogurt has both of these properties, which makes it a great way to fight postmenopausal osteoporosis. The benefits of yogurt largely depend on what kind you buy. See below for a quick checklist of which types are the best yogurt for osteoporosis during postmenopause. Plain yogurt is better than the fruit-flavored varieties because it usually contains less sugar. If you prefer fruit-flavored yogurt, try adding fresh strawberries, blueberries, or raspberries. Low-fat yogurt will typically have fewer calories and around the same amount of calcium as other options. Fresh yogurt is better than frozen as it has more live bacteria cultures, thus promoting a healthy digestive system. Plain, nonfat Greek strained yogurt could be the best option. Aside from a high calcium content, it also has twice as much protein, half the carbohydrates, and half the sodium of regular yogurts. Aside from consuming yogurt for postmenopausal osteoporosis, there are a myriad of other measures women can take to promote bone health after their reproductive years end. Click the following link for more information about highly effective osteoporosis treatments that will keep you up and going for longer.